Objective: Any operation leads to body stress and tissue injury that causes pain and its complications. Glucocorticoids such as Dexamethasone are strong anti-inflammatory agents, which can be used for a short time post-operative pain control in various surgeries. Main purpose of this study is to evaluate the effect of administration of intravenous (IV) Dexamethasone on reducing the pain after cesarean. Methods: A double-blind prospective randomized clinical trial was performed on 60 patients candidate for elective caesarean section. Patients were randomly assigned into two groups: A (treatment: 8 mg IV Dexamethasone) and B (control: 2 mL normal saline). In both groups, variables such as mean arterial blood pressure (MAP), heart rate (HR), respiratory rate (RR), pain and vomiting severity (based on visual analog scale) were recorded in different time points during first 24 h after operation. Statistical methods using repeated measure analysis of variances and t-test, Mann-Whitney and Chi-square tests were used for analyzing data. Findings: The results indicated that within-group comparisons including severity of pain, MAP, RR and HR have significant differences (P < 0.001 for all variables) during the study period. Between group comparisons indicated significant differences in terms of pain severity (P < 0.001), MAP (P = 0.048) and HR (P = 0.078; marginally significant), which in case group were lower than the control group. Conclusion: IV Dexamethasone could efficiently reduce post-operative pain severity and the need for analgesic consumption and improve vital signs after cesarean section. Any operation due to tissue damage causes the release of chemical mediators such as substance P, hydroxytryptophan, serotonin, bradykinin and prostaglandins, which stimulate the A (delta) and C nerve fibers and therefore cause to pain perception. Some of the body responses to pain are: Straight muscles hypertonia and spasm, increase of oxygen expenditure and acid lactic production, which can stimulate autonomic nervous system and increase heart rate (HR) and cardiac output. There are so many different methods such as patient control anesthesia, cryoanalgesia, local anesthesia, administering non-steroidal anti-inflammatory drugs, glucocorticoids or epidural or spinal opioids for reduction of post-operative pain. Different methods have been suggested for reduction of pain after cesarean section. Wu et al. evaluated and compared different dosages of Dexamethasone and droperidol in cesarean section and concluded that patients who received Dexamethasone experienced less pain and emesis. Furthermore, Shahraki et al., evaluated and compared the efficacy of intramuscular pethidine and oral methadone on pain relief after cesarean section and concluded that both methods have similar effects. Effects of subcutaneous and intravenous (IV) administration of Dexamethasone on pain and vomiting after cesarean section also was investigated. ,, However, there was not any study that investigate the effects of IV Dexamethasone on pain and also various vital signs after cesarean surgery. Furthermore, due to the high prevalence of cesarean surgery over the world and particularly in Iran , the current study was designed to investigate the effect of IV Dexamethasone on post-cesarean section pain, HR, respiratory rate (RR) and mean arterial blood pressure (MAP). A double-blind prospective randomized clinical trial (registered at Iranian Registry of Clinical Trials; registration code: IRCT201104095934N2) was planned from March until September 2010 on patients scheduled for elective cesarean delivery under epidural anesthesia at Beheshti Hospital, Isfahan, Iran. After obtaining approval from the Ethics Committee of Isfahan University of Medical Sciences, 60 nulligravida healthy women who delivered single term baby, with American Society of Anesthesiologists physical status 1 or 2 were recruited in this study. Written informed consents were obtained from all study participants, after describing all aspects of the study. Patients were randomly allocated to either case group who received 8 mg IV Dexamethasone or control group who received 2 mL normal saline (0.9%) based on simple randomization process using generated random digit numbers by statistical package for the social sciences (SPSS). 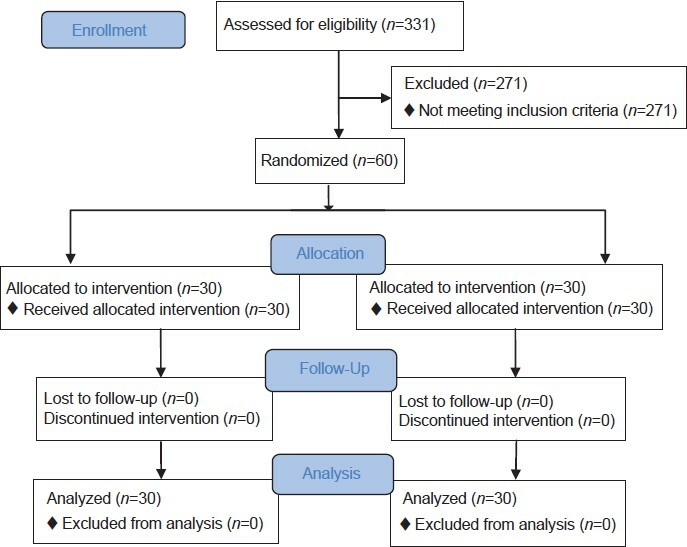 Neither the participants, nor the investigators responsible for following the participants, collecting data and assessing the outcomes were aware of the intervention assignments [Figure 1]. Patients were excluded if they had any conditions such as sensitivity or allergy to glucocorticoids, present or past history of peptic ulcer disease, glaucoma, diabetes mellitus Type 1 or 2, heart failure, fungal or viral systemic infection, hypertension or any other poor-controlled disease. Both groups received the same hydration therapy and local anesthesia method. About 500 mL lactated ringer solution were given IV before anesthesia to maintain a stable blood pressure. Local anesthesia in the L2-L3 or L3-L4 interspace through an epidural catheter was provided by 2.5 mL bupivacaine 0.5% and a single anesthesiologist and obstetrician were responsible for anesthesia and operation for all participants. All participants in both groups received 8 mg IV Dexamethasone or 2 mL normal saline 0.9% at the same period of time (immediately after clamping of the umbilical cord). During the follow-up period (24 h after cesarean section), average of MAP, HR, RR and severity of pain and vomiting were monitored and recorded at 0, 15, 30, 60 min and 2 (in the recovery room), 4, 6, 12, 18, 24 h (in surgery ward) after operation. Severity of pain and vomiting based on visual analog scale (VAS) was measured using a 10 cm ruler according to the self-reporting by patients. In this method, patient will be asked to indicate zero in case of having no pain and 10 if she has the most severe pain. For both the pain and vomiting, score ≤ 4 was considered as mild, 5-7 as moderate and 8-10 as severe. All patients received a routine dose of 4 mg Morphine at the time of the entrance to the recovery room and then if necessary (VAS > 4) for pain relief; however, caution was taken that the Morphine administration intervals should not be less than 4 h. Rescue antiemetic (metoclopramide 10 mg) was given if vomiting occurred. The incidence of side-effects such as agitation and rise of blood pressure during 24 h and patients' satisfaction were evaluated. Results are presented as mean ± standard deviation for continues (pain severity, HR, RR, MAP) and median for discreet (severity of vomiting, level of satisfaction and total morphine use) quantitative variables. The main statistical method for analyzing data was "repeated measure analysis of variances (ANOVA)." Mauchly test for checking sphericity condition as a perquisite assumption was conducted. In those conditions that this assumption was not satisfied, multivariate Wilk's λ test was used. Within group comparisons at each follow-up time points were tested using repeated contrasts and between groups comparisons were conducted using two independent samples t-test adjusted through Bonferroni correction. Qualitative variables (side-effects of different treatments) and non-normal quantitative variables were compared between groups using Chi-square test and Mann-Whitney U tests, respectively. P < 0.05 was considered as statistically significant. All analyses were performed using SPSS 16.0 (SPSS Inc., Chicago, IL). There were no significant differences among two groups in terms of age (mean age was 24.9 ± 3.5 in case group and 24.7 ± 3.6 in the control group). Repeated measure ANOVA results [Table 1] indicate that the difference of within-group variables of severity of pain, MAP, RR and HR are significant (P < 0.001). Multivariate test (Wilks' λ) of time × treatment interaction indicate that this interaction is statistically significant for pain severity (P < 0.001), MAP (P = 0.048) while marginally significant for HR (P = 0.074) and RR (P = 0.078). These results suggest that the levels of pain severity, MAP, HR and RR made across the studied time points are dependent on the type of treatment groups. Between group comparisons indicate significant differences in terms of pain severity (P < 0.001), MAP (P = 0.048), HR (P = 0.078; marginally significant), while the non-significant difference for RR (P = 0.408). Mann-Whitney U test showed statistically significant difference between groups in terms of level of satisfaction (P < 0.001); also it showed statistically significant difference in terms of total Morphine use between treatment (average of 4 mg) and control (average of 8 mg) groups (P < 0.001). Based on this test, the severity of vomiting was significantly different in two studied groups only at the time of the entrance to a recovery room (P < 0.001) while not in another times (data not shown). Chi-square test's results showed significant association between grouping variable and side-effects, in which side-effects in the control group were more than the treatment group (odd ratio = 6.3, 95% confidence interval; P = 0.01). Dexamethasone has an antiemetic effect by inhibition of releasing prostaglandins and serotonin in the gastrointestinal tract and endorphin in the nervous system. The effect of different dosages of glucocorticoids on reduction of post-operative nausea and vomiting has been documented in numerous studies, ,,,, though the minimum dose of Dexamethasone has been reported from 2.5 mg for gynecologic surgeries to 5 mg for thyroidectomy. ,, However, we didn't find any significant differences with this regard between two groups in our study. Jokela et al. and Hong et al., obtained similar results with our research. , Multiple doses of corticosteroid therapy (more than 1 week) may cause side-effects such as increase risk of infection, glucose intolerance, delayed wound healing, superficial ulceration of gastric mucosa, avascular necrosis of the femoral head and adrenal suppression;  however, these side-effects were not found after a single dose of Dexamethasone therapy. ,, Although another side-effect, which can be found by a single dose therapy is agitation,  but in our study, no early-onset side-effects such as agitation or rise of blood pressure were seen in Dexamethasone group. Although there was a significant difference between two groups in terms of total Morphine dose, the amounts of administered Morphine were higher in the control group compared with the treatment one; accordingly, it seems that the efficacy of IV Dexamethasone was not influenced by Morphine. In conclusion, IV administration of 8 mg dexamethasone immediately after clamping the umbilical cord can effectively reduce post-cesarean section pain and stabilize the vital signs of patients. 1. Wu CL, Raja SN. Treatment of acute postoperative pain. Lancet 2011;377:2215-25. 2. Liu K, Hsu CC, Chia YY. Effect of dexamethasone on postoperative emesis and pain. Br J Anaesth 1998;80:85-6. 3. Jokela RM, Ahonen JV, Tallgren MK, Marjakangas PC, Korttila KT. The effective analgesic dose of dexamethasone after laparoscopic hysterectomy. Anesth Analg 2009;109:607-15. 4. Kardash K, Sarrazin F, Tressler M, Velly A. Single dose dexamethasone reduces dynamic pain after total hip artroplasty. Pain Med 2008;4:1253-7. 5. Wu JI, Lo Y, Chia YY, Liu K, Fong WP, Yang LC, et al. Prevention of postoperative nausea and vomiting after intrathecal morphine for cesarean section: A randomized comparison of dexamethasone, droperidol, and a combination. Int J Obstet Anesth 2007;16:122-7. 6. Movafegh A, Soroush AR, Navi A, Sadeghi M, Esfehani F, Akbarian-Tefaghi N. The effect of intravenous administration of dexamethasone on postoperative pain, nausea, and vomiting after intrathecal injection of meperidine. Anesth Analg 2007;104:987-9. 7. Aminmansour B, Khalili HA, Ahmadi J, Nourian M. Effect of high-dose intravenous dexamethasone on postlumbar discectomy pain. Spine (Phila Pa 1976) 2006;31:2415-7. 8. Kaan MN, Odabasi O, Gezer E, Daldal A. The effect of preoperative dexamethasone on early oral intake, vomiting and pain after tonsillectomy. Int J Pediatr Otorhinolaryngol 2006;70:73-9. 9. El Azab SR, Rosseel PM, de Lange JJ, Groeneveld AB, van Strik R, van Wijk EM, et al. Dexamethasone decreases the pro- to anti-inflammatory cytokine ratio during cardiac surgery. Br J Anaesth 2002;88:496-501. 10. Shahraki AD, Jabalameli M, Ghaedi S. Pain relief after cesarean section: Oral methadone vs. intramuscular pethidine. J Res Med Sci 2012;17:143-7. 11. Jabalameli M, Saryazdi H, Massahipour O. The effect of subcutaneous dexamethasone added to bupivacaine on postcesarean pain: A randomized controlled trial. JIMS 2010;35:21-6. 12. Jaafarpour M, Khani A, Dyrekvandmoghadam A, Khajavikhan J, Saaidpour Kh. The effect of dexamethasone on nausea, vomiting and pain in parturients undergoing caesarean delivery. J Clin Diagn Res 2008;3:854-8. 13. Nortcliffe SA, Shah J, Buggy DJ. Prevention of postoperative nausea and vomiting after spinal morphine for caesarean section: Comparison of cyclizine, dexamethasone and placebo. Br J Anaesth 2003;90:665-70. 14. Martin JA, Hamilton BE, Sutton PD, Ventura SJ, Menacker F, Kirmeyer S. Births: Final data for 2004. Births: Final data for 2009. Natl Vital Stat Rep 2011;60:1-72. 15. Ahmad-Nia S, Delavar B, Eini-Zinab H, Kazemipour S, Mehryar AH, Naghavi M. Caesarean section in the Islamic Republic of Iran: Prevalence and some sociodemographic correlates. East Mediterr Health J 2009;15:1389-98. 16. Skjelbred P, Løkken P. Post-operative pain and inflammatory reaction reduced by injection of a corticosteroid. A controlled trial in bilateral oral surgery. Eur J Clin Pharmacol 1982;21:391-6. 17. Aasboe V, Raeder JC, Groegaard B. Betamethasone reduces postoperative pain and nausea after ambulatory surgery. Anesth Analg 1998;87:319-23. 18. Coloma M, Duffy LL, White PF, Kendall Tongier W, Huber PJ Jr. Dexamethasone facilitates discharge after outpatient anorectal surgery. Anesth Analg 2001;92:85-8. 19. Romundstad L, Breivik H, Roald H, Skolleborg K, Haugen T, Narum J, et al. Methylprednisolone reduces pain, emesis, and fatigue after breast augmentation surgery: A single-dose, randomized, parallel-group study with methylprednisolone 125 mg, parecoxib 40 mg, and placebo. Anesth Analg 2006;102:418-25. 20. Romundstad L, Breivik H, Niemi G, Helle A, Stubhaug A. Methylprednisolone intravenously 1 day after surgery has sustained analgesic and opioid-sparing effects. Acta Anaesthesiol Scand 2004;48:1223-31. 21. Bisgaard T, Klarskov B, Kehlet H, Rosenberg J. Preoperative dexamethasone improves surgical outcome after laparoscopic cholecystectomy: A randomized double-blind placebo-controlled trial. Ann Surg 2003;238:651-60. 22. Afman CE, Welge JA, Steward DL. Steroids for post-tonsillectomy pain reduction: Meta-analysis of randomized controlled trials. Otolaryngol Head Neck Surg 2006;134:181-6. 23. Bamgbose BO, Akinwande JA, Adeyemo WL, Ladeinde AL, Arotiba GT, Ogunlewe MO. Effects of co-administered dexamethasone and diclofenac potassium on pain, swelling and trismus following third molar surgery. Head Face Med 2005;1:11. 24. Lin TC, Lui MT, Chang RC. Premedication with diclofenac and prednisolone to prevent postoperative pain and swelling after third molar removal. Zhonghua Yi Xue Za Zhi (Taipei) 1996;58:40-4. 25. Holte K, Kehlet H. Perioperative single-dose glucocorticoid administration: Pathophysiologic effects and clinical implications. J Am Coll Surg 2002;195:694-712. 26. White PF. The role of non-opioid analgesic techniques in the management of pain after ambulatory surgery. Anesth Analg 2002;94:577-85. 27. Tzeng JI, Wang JJ, Ho ST, Tang CS, Liu YC, Lee SC. Dexamethasone for prophylaxis of nausea and vomiting after epidural morphine for post-caesarean section analgesia: Comparison of droperidol and saline. Br J Anaesth 2000;85:865-8. 28. Hval K, Thagaard KS, Schlichting E, Raeder J. The prolonged postoperative analgesic effect when dexamethasone is added to a nonsteroidal antiinflammatory drug (rofecoxib) before breast surgery. Anesth Analg 2007;105:481-6. 29. Song IH, Buttgereit F. Non-genomic glucocorticoid effects to provide the basis for new drug developments. Mol Cell Endocrinol 2006;246:142-6. 30. O'Sullivan BT, Cutler DJ, Hunt GE, Walters C, Johnson GF, Caterson ID. Pharmacokinetics of dexamethasone and its relationship to dexamethasone suppression test outcome in depressed patients and healthy control subjects. Biol Psychiatry 1997;41:574-84. 31. Hong JY, Han SW, Kim WO, Kim EJ, Kil HK. Effect of dexamethasone in combination with caudal analgesia on postoperative pain control in day-case paediatric orchiopexy. Br J Anaesth 2010;105:506-10. 32. Splinter W, Roberts DJ. Prophylaxis for vomiting by children after tonsillectomy: Dexamethasone versus perphenazine. Anesth Analg 1997;85:534-7. 33. Cardoso MM, Leite AO, Santos EA, Gozzani JL, Mathias LA. Effect of dexamethasone on prevention of postoperative nausea, vomiting and pain after caesarean section: A randomised, placebo-controlled, double-blind trial. Eur J Anaesthesiol 2013;30:102-5. 34. Wang JJ, Ho ST, Lee SC, Liu YC, Ho CM. The use of dexamethasone for preventing postoperative nausea and vomiting in females undergoing thyroidectomy: A dose-ranging study. Anesth Analg 2000;91:1404-7. 35. López-Olaondo L, Carrascosa F, Pueyo FJ, Monedero P, Busto N, Sáez A. Combination of ondansetron and dexamethasone in the prophylaxis of postoperative nausea and vomiting. Br J Anaesth 1996;76:835-40. 36. Fujii Y, Saitoh Y, Tanaka H, Toyooka H. Granisetron/dexamethasone combination for reducing nausea and vomiting during and after spinal anesthesia for cesarean section. Anesth Analg 1999;88:1346-50. 37. Cook AM, Patterson H, Nicholls J, Huddart RA. Avascular necrosis in patients treated with BEP chemotherapy for testicular tumours. Clin Oncol (R Coll Radiol) 1999;11:126-7.